As a member of the class of 2019 and potential Neuroscience major, this course provides me with the means of fulfilling my inner desire to investigate unique applications of scientific procedures outside of a laboratory setting. I feel that my strong attention to detail and relentless pursuit of understanding will undoubtedly contribute to the collaborative effort of my classmates. I wish to leave this class knowing that we made a difference. In most courses you leave with only a grade to display your hard work and effort; however, from this class, I am anxious to look back on our research and forever be able to say that I contributed to such a unique opportunity, one made available only to a select group of students. Notes on our examination of the portrait using the museum’s portable x-ray fluorescence instrument. This week, we utilized our class time to reflect on all of the previous methods of non-invasive analysis we have conducted. As this project nears completion, it is essential that all of our data is not only recorded for later entry in the APPEAR database, but it is also important that we as researchers fully understand the methods utilized to physically obtain the data. For that reason, this class period ensured that students from both groups solidified their understanding of the various methods implemented in the past weeks, and in the end, time still remained to perform X-Ray fluorescence on the “Portrait of Young Man”. Prior to entering the world of X-ray fluorescence (XRF), we reviewed our primary methods of analysis that have been discussed in further detail in prior blogs. We re-examined the cost-benefit analysis of invasive vs. non-invasive methods and learned specifically about different methods of invasive analysis, something we have not been previously exposed to due to the fact that such analysis is used sparingly on art, such as the mummy portraits, in order to minimize any further damage to their surfaces. Then, we summarized what information becomes available through each of the following methods: Basic Examination, Stereomicroscopy, X-Rays, Multi-Spectral Imaging, and Reflectance Transformation Imaging. After all past methods were reviewed, we delved into XRF. XRF is a method of analysis that provides information about the elemental composition of the surface of objects. How this works is that the surface of the object in question is bombarded with x-rays from the instrument. The energy from the x-rays excites the electrons of whatever element is present, and in turn the elements are discharged from their innermost energy shells. When the electrons are released, electrons from outer shells move down to replace the vacancy formed, and when the electron from the outer shell moves down, it releases energy in the form of a photon. The XRF detector captures and aggregates this data by generating peaks along a spectrum; each peak corresponds to the specific energy for the specific electron released of that specific element. The values for each of these peaks can be compared to a periodic table containing the values for the removal of electrons from two different shells. The reason the table has values for two shells is because in some cases, such as ours, the spectrometer used cannot produce an energy level high enough to remove electrons from the inner most shell, thus making element identification impossible; however, if it is strong enough to remove electrons from more outer shells, then the periodic table can still be used to compare the values for the peaks to the values on the table corresponding to more outer shells, and as a result, elements can be identified. This is particularly important for elements such as lead, which we know was used on our paintings from our x-rays. While the information gained from XRF is extremely powerful, we must be aware of several factors that influence our interpretation of the data. First, portable XRF (which we use here) is a qualitative technique and tells us only what elements are present, rather than how much of that element is present. Second, depending on the thickness of the paint layers, and whether the painting itself is more or less homogeneous, some elements may or may not be excited or the photons released from them may not reach the detector. Finally, the XRF only gives us elemental information, for example, “lead”. So we must go back to the painting and consider whether the lead is related to a lead white pigment, a red lead pigment, lead from some other source, etc. This is why using XRF as only one of a group of methods of study is essential. 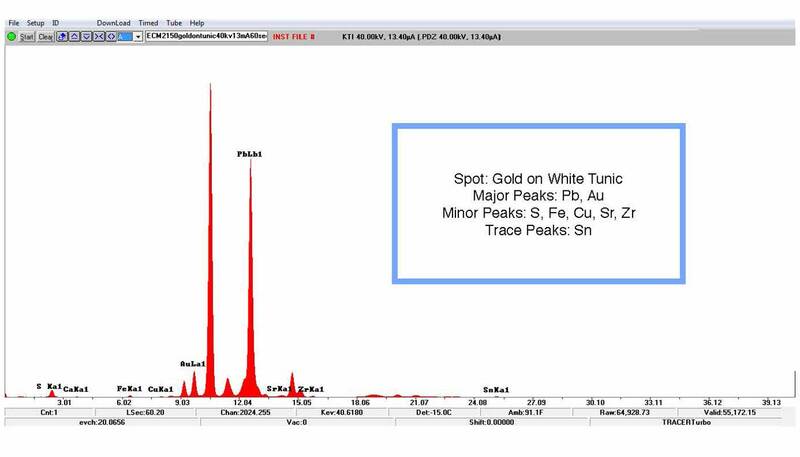 An example of a spectrum produced by our Bruker Tracer III SD portable XRF instrument. This is the area of gold on the white tunic. Keeping these concerns in mind, we examined five points on “Portrait of a Young Man” as indicated on the above image, and the peaks at these points were analyzed. The elemental composition of these spots is illustrated in the above images and each individual peak was matched with its corresponding element. Although lead appeared to be the dominating major peak for all five spots (which makes sense due to the presence of lead white), we were able to confirm the presence of gold in the lower proper left corner, on the white tunic. The determination of another major peak in the form of gold, in a spot where the presence of gold could be confirmed visually, gave promise that the data obtained from the previous spots was for the most part accurate. During this week, individual microscope analysis continued and it was found that specks of gold were present in the areas of the chin and cheeks, thus opening the door for further X-Ray fluorescence to confirm our visual findings. 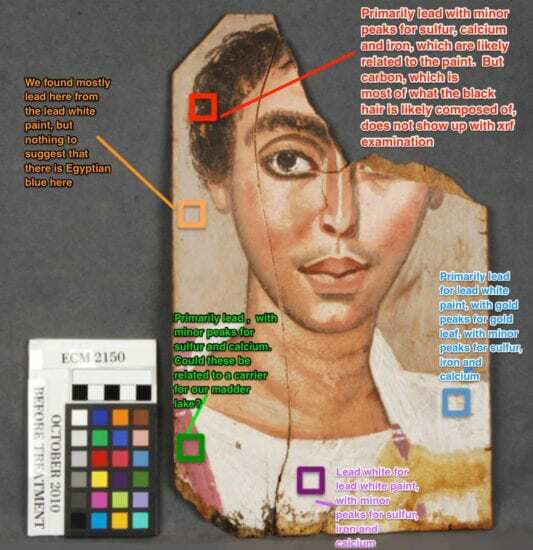 If gold is found throughout the face, this will raise the question of whether gold may have been mixed with pigment for all of the areas that depict skin tone or if the gold landed on the painting from another source. We are anxious to find the answer to the question in further classes and foresee the final weeks revealing even more about these mysterious paintings. Great article! XRF was a great test to use, and I am interested to see if we find any signs of indigo in the Portrait of a Young Man. I think indigo might be the blue substance we find throughout the portrait. I am excited to wrap up our research and pull together all that we know in order to get a good picture of who our Young Man is! Great summary Anthony! I’m so intrigued by XRF as a method of analysis. Even at our discussion at the Walters, we’ve seen how useful this data is in finding patterns. I can’t wait to eventually look at all of the data from the APPEAR project and see what broad relationships come out of certain pigments with certain elements – especially looking at how puzzled we were by the presence of sulfur. XRF is both amazing and slightly frustrating. While it is helpful to know what elements are present, it is unfortunate that we are unable to discern how much of the element is present or why it is present. XRF is a really intriguing way to test out the composition of the layers. I wonder whether it is possible to accumulate data for the ground layer since it is under the top layer. Also, I wonder whether there is an instrument that figures out the composition of the organic make up like madder lake and indigo without being destructive. Great article Anthony! I’m very curious about the sulfur present in the XRF examination. Does it indicate ground layer? Or is it an element related to burial? I’m very excited to see what element will be detected on our “Portrait of a Man” and compare the result with the “Young Man”. We are almost at the end guys! XRF was really fascinating to use. I personally thought it was really scary how close the machine had to get to the portrait! But it was interesting to break down all of the pigments and substances we have been talking about down to a more elemental level. I can’t wait to see how all of our work pieces together! Great article Anthony! Good post Anthony! Its fascinating to me how every time we add a new method to our study of these portraits we only know so much. The presence of lead is now confirmed but we still can’t be sure if its white lead or red lead. With each answer comes more mysteries but its exciting to see all that we have learned! Also when beginning this project I couldn’t imagine that we could do something such as XRF and reflectance transforming imaging within our own museum room. I thought that using the XRF was so interesting! I thought that it was a little frustrating how we can only identify the elements but not know where they came from. I really want to know where the tin came from and why it is there. Great article! XRF was such a great tool to use that extracted information regarding the pigments I thought wasn’t possible without an invasive method of sampling. As technology and its uses in the archaeological world improves and expands with each passing day, I can’t wait to see what other forms of tech we can use to non-invasively decipher what exactly these mummy portraits and others are composed of. Great article Anthony!